Ivan Garcia Bauta is a Casa resident, violinist, children’s orchestra founder & former director and former music teacher. We spoke to Ivan and found out lots of interesting info that you might want to check out! In 1996, Ivan, while already teaching at a music school in Cienfuegos, Cuba, and working as a professional violinist, founded Los Aragoncitos de Cienfuegos, a well-known children’s orchestra that performed Cuban music in Cuba and around the world. Many of the kids are now professional musicians in New York, Miami, Paris, and elsewhere. We discovered that Ivan knows and performs with percussionist Bruno Vinezof. In fact, in Leticia Rodriguez’s YouTube video above, you can see Ivan performing with Bruno. He is a longtime friend of Melissa Buhrt and her husband (and former Casa staffer) Christopher Newton. 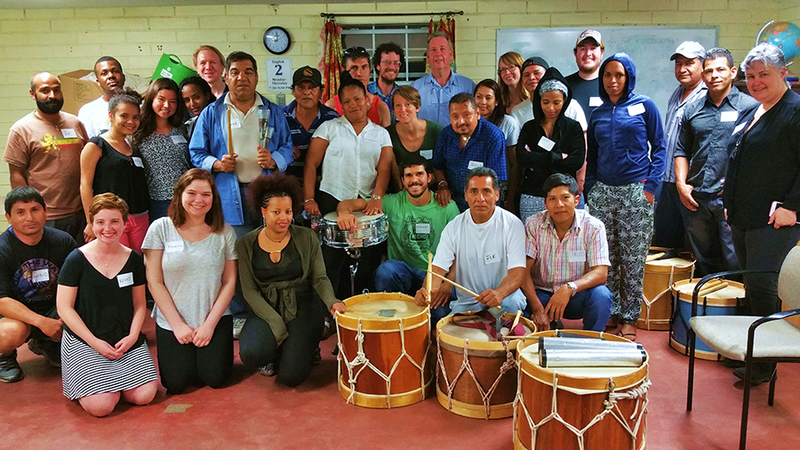 He also founded and leads Maracatu Texas, a percussion ensemble featuring Melissa & Christopher. Additionally, Melissa, Christopher, Bruno, and the rest of Maracatu Texas have performed at Convivio. Below, Bruno is in a white t-shirt & shorts, Christopher is in a blue & white striped shirt, and Melissa is wearing a salmon-colored top. When Melissa & Christopher got married last year (after they were pronounced husband and wife) they each put on a drum and led the end-of-the-ceremony procession down the aisle with drumming. They then joined other members of Maracatu Texas and performed a celebratory set before their wedding reception began. At Melissa’s invitation, Bruno came to ESL in March and led an awesome drumming workshop in the very room where Ivan now sleeps. It was so much fun! Melissa & Christopher also love gardening & native Texas plants. 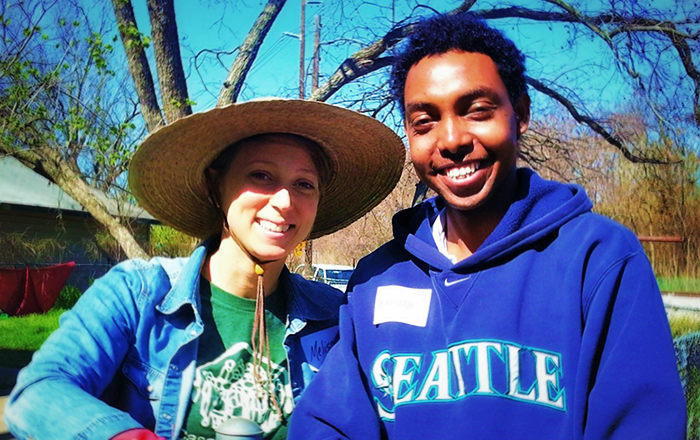 Melissa and former resident Ermias (pictured at top) helped create and plant some of Casa’s beautiful garden beds! YouTube videos here and here. Article about the orchestra’s trip to Nova Scotia.